One of the joys of advancing years is the accumulation of memories which can be accessed and replayed at will. Indeed, one of the drawbacks of advancing years is the tendency to play these memories so extensively that they obscure the present and obliterate the future. Aware of this tendency to dwell in the past rather than use it to direct one’s present actions to the benefit of the future, I try to avoid too much gratuitous recollection, especially in polite company. 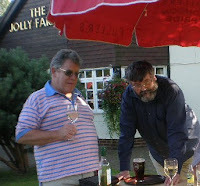 But spending a couple of days with my oldest friend Peter Almond – our friendship goes back over half-a-century – had us quickly falling into the trap of looking to the past when, ostensibly, discussing the present. Having presented Peter with a copy of the Rütti Organ Concerto over which I have enthused both in this blog and in Gramophone, we got to discussing the music, the playing and the recording. The Rütti appears on the Guild Records label and Peter wondered whether it was in any way connected with the Guild Records which our mutual boyhood hero, Barry Rose, had founded during those heady days when he was Choirmaster at Guildford Cathedral. I was able to tell him that it was, that the enterprising Swiss music enthusiast, Kaikoo Lalkaka, had bought the whole business and the catalogue, and while he has been busily increasing its scope to bring in Swiss music as well as British choral and organ music, unlike some other labels who delete discs almost as soon as they release them (Priory came up for especially criticism in our communal rant), Guild continue to make the back catalogue available, whether they were released by the Barry Rose company or the Kaikoo Lalkaka one. 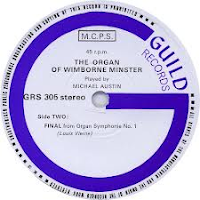 Peter suggested that, if I was right, then he would be able to buy the EP recording of one of my old organ teachers, Michael Austin, playing on the Wimborne Minster organ. No, I assured him, the current Guild catalogue included no Michael Austin and comprised original CDs or transfers to CD of former LPs. In any case, I told him, the Michael Austin record was on the Ryemuse label. 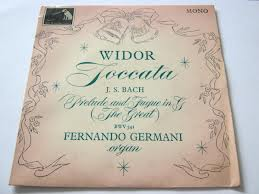 Rifling through his impeccably maintained collection, Peter quickly rooted out the record in question and, sure enough, it was Michael Austin at Wimborne playing Bach, Vierne and Francis Jackson on an EP released by Guild Records. I do have a copy of that record, but my extensive cataloguing system has not yet included the EPs in my collection and, in any case, it all seems to have been put beyond my reach for perpetuity following my relocation from Singapore, so I have no means of checking, but I could swear my copy is not on the Guild label. I am probably wrong. But the discussion led us, with awful inevitability, to a trip down memory lane and the organ records we had, as boys, regarded as prized possessions. 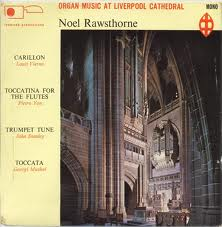 In addition to the Michael Austin, there were the EPs of Fernando Germani doing Widor’s Toccata and the Bach Prelude & Fugue in G on Selby Abbey (with its wedding-themed sleeve from HMV) and the Ryemuse one (yes, I am certain of that) of Noel Rawsthorne on the mighty Liverpool Anglican Cathedral, a record which introduced us to the Mushel Toccata and Pietro Yon’s Toccatina for the Flute. 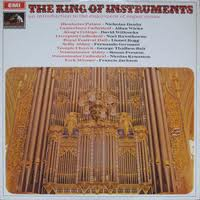 And on LP there was the Ace of Diamonds recording of several organists playing on the then new Liverpool Metropolitan Cathedral instrument, and “The King of Instruments” compilation LP released by EMI as a test for stereo equipment. As we mentioned each one, Peter recalled how a recent conversation with another organist friend had revealed that he had accumulated the same records in his youth, while I know of numerous organists of our generation who, similarly, possessed the same records. Then there is the anecdotal evidence; I never forget a trip into the old UMP showroom in Montague Place in a bid to find a copy of the Jean Berveiller Mouvement which Jeanne Demessieux plays so brilliantly on the Liverpool Metropolitan record only to be told, “Everybody is coming in asking for that. We don’t think it can have been published”, while mention of the Norman Cocker Tuba Tune when it appeared on a recent CD from St Edmundsbury occasioned a flurry of correspondents recalling the “iconic” recording by Francis Jackson on York Minster included on “The King of Instruments” record. It seems very much as if those boys who, in the 1960s, developed a keen interest in the organ, all seem to have bought the same records. Could it be, we asked ourselves, that these were the only organ records available? I’m sure not. I remember about that time attending something at the RSCM in Croydon where Michael Fleming claimed that organ and church music records were more numerous than any other genre; something I am sure was not then, nor has ever been, true. But certainly there were a lot of organ records about. 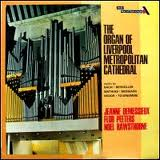 Every trip to a British cathedral netted an EP of the organist playing the organ there (often remarkably badly), while EMI capitalised on this with their intriguing, if flawed, “Great Cathedral Organs” series. Perhaps it’s rose-tinted nostalgia, but I happen to think that this quintet of organ records was, in every sense of the word, iconic. They not only captured fine organs and fine organists of the day (something the EMI series did, if at all, only by accident) but they presented enticing repertoire which offered vivid entertainment for the enthusiast. I don’t really see the same enthusiasm for organs generated amongst today’s youth by the ghastly screeching of Couperin on authentically-restored 17th century French organs, the nerve-wracking unequal temperaments of wheezy 18th century North German museum-pieces giving us Bach and Buxtehude as it was originally heard, or the stomach-churning weightiness of Widor complete symphonies on a dusty Cavaillé-Coll. Worthy and important as these are, you do have to attract your audience before you can lead them in the direction of historical authenticity or specialist repertoire; something which is often lacking in a lot of organ discs today. I certainly would never suggest that organ recordings were much better in my youth than they are today, but few engender quite the same level of deep affection among the young. Well said, Marc! It does concern me that today's youngsters, who rely more and more on downloads, will have, unlike us, very few physical items to prompt their memories in the years to come. I think it was partly the actual format of recorded music (LPs/EPs), coupled to the fact that records were a relatively expensive commodity, that made us treasure our collections all the more highly.